This year, Google was generous and gave us two Nexus devices to gawk over: the high-end Nexus 6P by Huawei and the more mid-range Nexus 5X by LG. We’ve decided to take a look at the fancier of the two — after all, the “P” in “6P” does stand for premium. And it’s a really interesting device. Made by the relatively unknown (at least in the US) Chinese manufacturer Huawei, it veers strongly from the soft plastic design of the Nexus 5X, but you still get all the advantages of having a device running pure Android Android Skins Explained: How Do Hardware Makers Change Stock Android? Android Skins Explained: How Do Hardware Makers Change Stock Android? Hardware makers like to take Android and morph it into something that is entirely their own, but is this a good or a bad thing? Take a look and compare these different Android skins. Read More . Is it really the best option in the Nexus lineup? This is a gorgeous phone — depending upon how you feel about that black bar along the top of the back. I think it’s a really nice aesthetic, and I love the huge landscape-oriented Nexus logo. The edges are chamfered in a nice (if iPhone-like) style, and the whole thing is made of a very solid metal. To tell the truth, though, it’s a huge phone. It’s even bigger than my current OnePlus One Top Six Best Features Of The OnePlus One -- And One Drawback Top Six Best Features Of The OnePlus One -- And One Drawback I've been living with the OnePlus One for a few weeks now, and it's amazing, but it's not perfect. Let's run through some of the best features -- and one downside. Read More , and despite my relatively large hands, I struggle to use this thing one-handed. It’s not just that it’s large, but the metal is also extremely slick. It’s a slippery phone, and I’m in constant fear that I’m going to drop it while using it. So those pretty looks and large screen come at a price — gripability. I also pressed the volume buttons a few too many times on accident as I was trying to shuffle this monster around in my hand. The power and volume buttons are low enough to make them easily pressable, but they’re also right where you need to put pressure to be able to keep this thing from falling. To some, “large metal phone” is going to be a bit off-putting, but for others, it’s the premium device they’ve always wanted. It really comes down to personal preference here. Personally, I’m not sure if I would want to use this phone longterm without a case. The enormous 5.7″ screen on the 6P is an AMOLED Common Mobile Display Technologies You Should Know Common Mobile Display Technologies You Should Know When you're comparing different mobile devices, whether they're phones, tablets, e-readers, or laptops, one of the differentiating features can be the display technology. But do you know the differences? Read More display, which means it has good contrast and is able to selectively turn on pixels — this allows for the Ambient Display feature, which can show you the time and your notifications in black and white when you pick up the device or get a new notification. I didn’t find Ambient Display to be particularly useful — I prefer the built-in LED for letting me know about notifications — but for some, it’s a nice way to save battery by turning the screen on less. In general, the screen isn’t the brightest I’ve ever seen. You could have some issues viewing it in direct sunlight, but other than that, it’s hard to beat that WQHD quality. You definitely won’t spot any pixels here. If I could only choose one feature to talk about in this review, it would be the speakers. They are fantastic. Dual front-facing speakers really need to become standard in the smartphone industry. At full volume, this phone easily fills a room with music. And if you hold the phone at full volume, you can feel the speakers vibrating — that’s some power. I really enjoyed listening to music with the Nexus 6P; its speakers just weren’t comparable to any other smartphone I’ve used. They were even louder than the HTC One M9’s dual front-facing speakers HTC One M9 Review and Giveaway HTC One M9 Review and Giveaway Metal design? Check. Expandable storage? Check. All the most powerful internals? Check. On paper, the HTC One M9 is one beast of a phone. Read More . The 12MP shooter on the rear of the Nexus 6P has an impressive f/2.0 that results in some very good low-light photos. Even the 5MP camera on the front has a decent f/2.4 and takes solid selfies. But what I really enjoyed was the built-in camera app — the Google Camera app Google Camera: The Official Vision for An Android Camera App Google Camera: The Official Vision for An Android Camera App Today I'd like to tell you about a camera app that doesn't do very much -- by design. You should still try it, though, because it comes direct from Google. Read More . It has some wonderful secret features Three Secret Features Of Google’s New Camera App That Will Blow Your Mind Three Secret Features Of Google’s New Camera App That Will Blow Your Mind Google’s recent update to the KitKat camera app boasts a few secret abilities, including an accidental tilt-shift effect, 3D image capability and something of a wide-angle effect. Read More , but specifically for the Nexus 6P, Google has added some other cool tricks like SmartBurst (hold to take burst photos, easily create collages or GIFs), Auto-HDR+, slow motion video capture, and an improved user interface. And honestly, it’s great. It takes photos super quickly, they come out nice and clear, and the interface is lovely. Alright, so here’s the big notable change we can all talk about and debate the merits of. For me, I found the fingerprint scanner to be a double-edged sword. On the one hand, it’s super fast and convenient when you’re holding the phone. The sensor is located on the back of the device right where your index finger would naturally fall, and you can unlock the screen instantly by just lightly touching it. Seriously. It’s so fast. You don’t even have to wake the phone first! But, the other side of that coin is that if your phone is resting on a table, there’s no good way to wake it up. You have to pick up the phone to use the fingerprint scanner, and there’s no double-tap to wake, so you have to feel around for the power button and then type in your backup PIN. I want to love the fingerprint scanner. It’s brilliant when you’re holding the 6P, but leave it sitting on your table, and it’s going to become a good deal more annoying to wake up. Ah, now this is really why you’re buying a Nexus device, right? The 6P runs pure, stock Android, which means that you’re getting Android exactly as Google imagined it. On top of that, you get updates immediately and don’t have to wait for manufacturers and carriers to work through their bureaucracy. Of course it’s running the newest version of Android, 6.0 Marshmallow Android 6.0 Marshmallow: What It Is and When You'll Get It Android 6.0 Marshmallow: What It Is and When You'll Get It Android Marshmallow is here -- but why should you care? Read More , and it’s dead simple to use. Google has made a few nice additions to Marshmallow that generally make things more intuitive. One of the best examples of this is Google Now on Tap. Simply hold down the home button, and Google will show you relevant information about the things on your screen. But in general, it’s the Android you know and (hopefully) love. You won’t find all the bloatware of a Samsung device here, and if you buy unlocked from Google or Amazon, you won’t have any carrier bloatware either. It feels like a clean, smooth experience in the software department. Plus, rooting could not be easier since it’s a Nexus. If you’re a fan of rooting your device and customizing it with custom ROMs, this is the phone for you without a doubt. Given the powerful Snapdragon 810 processor and 3GB of RAM that are in this beast, you shouldn’t expect to encounter apps that lag or stutter. I managed to multitask, watch videos, and play games without any trouble. Many were worried about the Snapdragon 810 having overheating issues, and while it certainly got warm after prolonged periods of usage, I wouldn’t say that it was worse than other phones. Powered by a 3450mAh battery, the Nexus 6P definitely isn’t lacking in juice. It does have to power a huge screen, though, so your screen on time might not end up being the best of any smartphone — but it’s definitely not bad. Its standby when not using the screen is great, probably thanks in part to Marshmallow’s new Doze feature that puts your apps to sleep while the screen is off. But really, I made it through my days without a problem using the Nexus 6P. I’d say it has above average battery life, but the best part about the it is the fast-charging that is available thanks to the new USB Type-C What Is USB Type-C? What Is USB Type-C? Ah, the USB plug. It is as ubiquitous now as it is notorious for never being able to be plugged in right the first time. Read More . Sure, your old microUSB cables aren’t going to work with the Nexus 6P, but that’s only because this phone is the future. The world is moving towards USB Type-C to replace microUSB and regular USB ports — and that’s fantastic because it’s a small universal port and it’s reversible. No more putting in your cable the wrong way. Still, the 6P doesn’t support wireless charging. That’s a bummer, but the USB Type-C charging is much faster anyway. The model that I tested was the 64GB Frost, but it comes in three different colors, three different storage options, and three different price ranges. The colors are Frost, Graphite, and Aluminum Silver. The 32GB is $499, the 64GB is $549, and the 128GB is $649 at the Google Store. Though the 32GB is currently on sale on Amazon from Huawei for $599. That’s still a bit cheaper than other high-end phones like the Samsung Galaxy S6 Edge Samsung Galaxy S6 Edge and Gear VR Review and Giveaway Samsung Galaxy S6 Edge and Gear VR Review and Giveaway Samsung sells more Android devices than any other manufacturer, and thanks to some aggressive marketing, the Galaxy brand is almost synonymous with Android. Read More or iPhone 6s iPhone 6s Review and Giveaway iPhone 6s Review and Giveaway Spoiler alert: if you like iPhones, you’re probably going to love the iPhone 6s. But are you really surprised? Read More , but nowhere near as cheap as some budget Android 5 Ways Cheap Android Smartphones Beat the Flagships 5 Ways Cheap Android Smartphones Beat the Flagships Who says you need the latest and greatest (and most expensive) smartphone out there? The cheaper alternatives are actually really good. Let us show you. Read More smartphones like the OnePlus X OnePlus X Review OnePlus X Review How do you make a single phone that pleases everyone? OnePlus seems to think that you can't. A few months after the OnePlus Two, comes the OnePlus X, a smaller, cheaper device. Read More . For what you’re getting, it’s not a bad deal. This is clearly a high-end smartphone, and it’s priced pretty fairly for that. The Nexus 6P is a mammoth of a phone, but we live in a world of phablets now. Its fingerprint scanner has its advantages, but what I really love about this phone is the speakers — and that enormous screen certainly isn’t a downside either. I just wish the phone was less slippery. 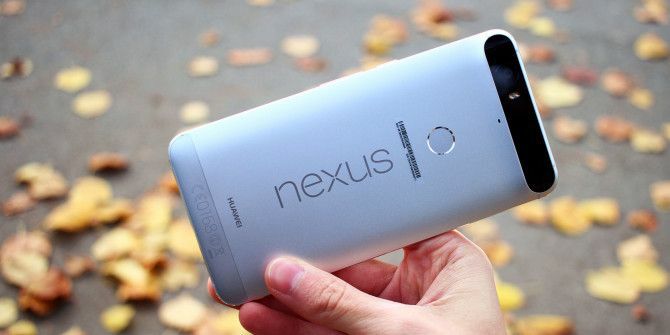 Explore more about: Google Nexus, MakeUseOf Giveaway. The One DSLR Accessory You Should Buy: Zhiyun Crane 3 LabWhat Is the Best Way to Stream Music for Free on Android? Hey guys you can also try the new AuPiVi Stream Player. You can Stream your Music in the group. I hope this is not a scam that "makeuseof" is making people signup and tweet their video link without really giving away the phone. It's for us to ask who the winner is and from which country. why dont u publish the winner??? do you make shipments out of USA ? and what happens with the phones warranty? tbh idk who the winner is because i don't handle that stuff, but if you haven't received an email from us, you probably did not win. sorry. I'm wondering too! we'll just have to be patient. and yes it is a great phone! i'm not sure, but they should have been contacted by email or will be shortly. The Nexus 6P is by far the best Android I've ever owned. It's also by far the best I've even tested in a store... It is truly Amazing !!!!!! How much enteries does a winner make?? How do I enter each day? Not bad phone, if u ask me. Our budget this year with us having a baby back in April of 15 means me and my wife are sooo behind on phones (she's still using 1st Gen Moto X). Hopefully, we can get an Internet miracle and upgrade to a Nexus 6P. Thanks for the giveaway and good luck to all. dang, good luck with the baby and the giveaway! Pretty amazing phone that could finally allow me full use of instagram features and get my business going. Maybe actually view what is on the screen! Best of Luck to everyone! I can only repeat what everyone's said. Best of luck to everyone and thank you for running this comp. It's one incredibly sweat smartphone. no problem :D and yeah it is pretty great. Best of luck to all who enter. Fingers crossed as always. The Google Nexus 6P Looks Beautiful with great features, and I love the size. Unfortunately it is out of my price range, but a girl can dream????. Good Luck to ALL of us who enter????!! Ok so I didn't know emoji's come up as ?'s. 5. After using htc (rezound) and Samsung (GS4), there were some things that I missed from these carriers, but I definitely don't miss the bloatware. Can you hear me now, Verizon? One thing that this review misses is that you can also sign up for Google Fi with this phone. I got Fi and ditched Verizon - will cut my bill in half, and will work in most countries. Only a 7 out of 10? yeah man, it's expensive, slippery, and not very intuitive to turn on/off if it's resting on a table. it's not a bad phone by any means, just not the absolute best out there (in my opinion, of course). It looks like on the whole to be a great phone . I hope I win! Just in time! I need a new phone. Haven;t won anything till date still hopeful that I'll break the jinx. Thanks for the review and giveaway. Looking forward to have a chance to use the 6P.???? Sounds very interesting to have and test, as well as to test my developed apps on it. Emulators are very slow. Would be interested in adding this with google fi. I actually owned a Nexus 6P for 2 days before I lost it. I did like the camera but didn't appreciate the way all of my personal information transferred from my Samsung Galaxy 4S. I spent hours trying to find my photos and contacts. Since the Galaxy 4S runs on a version of Android I wish that there was a cleaner way to transfer my data from one phone to the other. Come on Google get with the program! I also found it interesting that even if I use another email provider, Outlook from work that it forces all emails into a Google email account. A bit too proprietary for comfort. I prefer options, not one size fits all. Why is it that these sorts of things are seemingly never reviewed? i think we just have very different experiences with the services we sync. I personally only use Gmail for me email, so that wasn't an issue for me. likewise, all of my contacts and photos easily transferred from my daily driver to this device because i backup everything through Google Contacts and Google Drive. i guess we're just very different users, and it might just be that most reviewers are in a situation more like me. sorry, but we can only review from our personal experience! Nexus has always been the great phones and I am an android developer so I know how advanced thus phone is. Thanks for the review. Still on the fence about buying one but would love to win one. Thanks for your review, this phone looks like it would be perfect for me. I would love to try it with the Google wireless service. Can only get 5 chances to win for subscribing to youtube channel, none of the others works. Watched the video twice and nothing happens, no code appears. Nice review. But this is your job. Merry Christmas and Happy New Year! Props to Google and Huawei to making this phone. Been with the same iPhone 3G ever since it came out, and been a hermit. Now is a good time to change to this phone. Review caught my eye and loved the way he gave it. Loved the article too - very descriptive. Many Big Thanks for this Amazing Year Ending Giveaway. Hope to Start my New Year with a Grand Win. Wish U everyone a very very Prosperous New Year ahead. Great features for a phone so slick and from Google itself! Huawei makes some damn good piece of hardware! Hopefully I get a new year present! Now would be a good time to win one! Man, talk about a hot phone! A really nice review too! I wanna tell "andrepamendes" that the giveaways are FOR REAL!!! And I hope that I'm the lucky one this time around! I wish you all a VERY MERRY CHRISTMAS and a Happy New Year!!! Really nice review and a great phone. I have a Nexus 6. There isn't enough milk, cookies and foot rubs to convince her to let me pay for the upgrade haha. Merry Christmas. Super looking device and well built. Overall, a lush phone. Now that's a phone i would like to have. Thanks to Makeuseof, we get to see some awesome reviews and giveaways. Hopefully Santa does make it shine for me this time /\|/\. Its the ability to customize without useless bloatware that attracts me to this huge phone. You did an excellent review!! Nice review! 6P is so cool ! I love how brief, crisp and accurate your reviews are. Another great review. Also thanks for the giveaway. I would love to win this phone as it is amaaaaaazing!!! Where do I enter the giveaway? Just by entering a comment? The Nexus 6p is a beautiful device. I hope I can win lol, and a very good review. Will recommend! I hope I win because I am in need of a good phone. Keep up the reviews! It really helped me decide if I like this phone. A very good observation on just having a fingerprint reader to wake up, and that's on back of the phone too. But it is a nice phone. The King of Android Smartphones right now! yeah Nexus devices usually get that title :P it's a nice phone for sure! It's always interesting to watch the direction that phone manufacturers move in with their new models. Seems there's a lot of good things to be said for this one. definitely! those dual front facing speakers are magicalllll. I'm on disability so I really can't afford a new phone for my wife right now, & she needs a new on. I really like the pure Android OS, too.